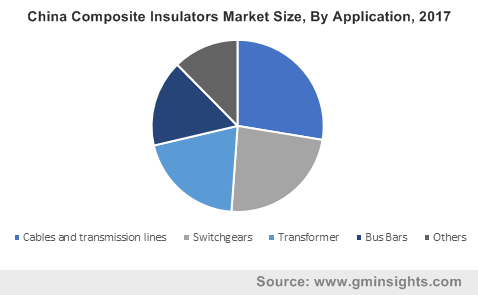 Composite Insulators Market size was valued over USD 1.5 billion in 2017 and is set to exceed an annual installation of 100 million units by 2024. 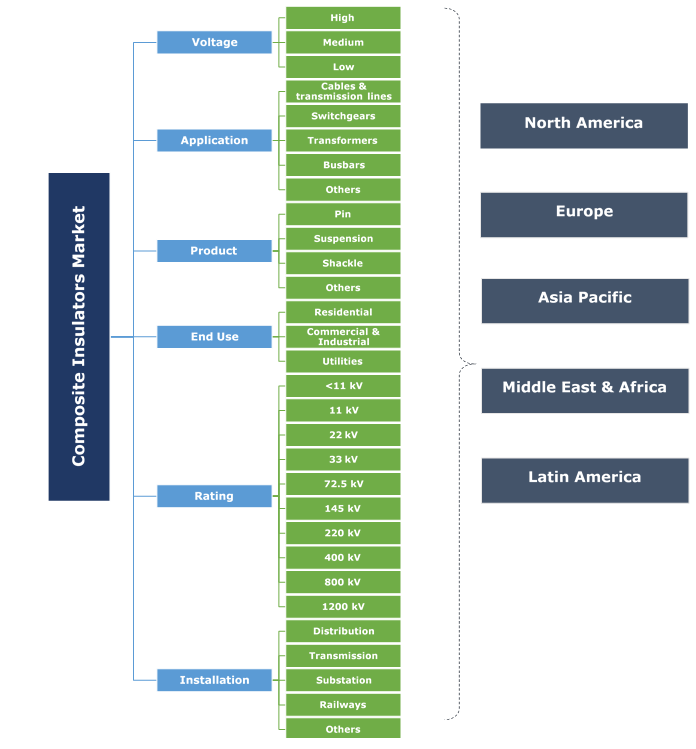 Rising investments to refurbish the aging grid networks across developed nations along with the rapid adoption of smart grid technology will boost the global market size. Enhanced expenditure for the modernization of grid networks coupled with government measures to replace unreliable infrastructure in order to mitigate power interruptions will further drive the industry outlook. The Federal Energy Regulatory Commission (FERC) stated that the electric companies in the U.S. invested over USD 160 billion to develop new T&D architecture from 2013 to 2016. Growing emphasis toward the expansion of grid networks along with massive investments by regulatory authorities for the development of efficient electric infrastructure will stimulate the market growth. The Canada Infrastructure Bank in conjunction with the local and provincial governments authorized an investment of USD 35 billion to transform the country’s outdated grid infrastructure. Ongoing shift toward cost-competitive renewable energy sources for the generation of electricity for the steeply growing population will further propel the industry dynamics. Continuous development of transmission infrastructure to avail safe and reliable power across developing nations will boost the high voltage composite insulators industry. Considerable investments by utilities for transmitting electricity over long distance will further stimulate the industry landscape. Light weight, durability, good hydrophobicity and resistance against vandalism are some of the significant features contributing to the increased product adoption in HV lines. Medium voltage composite insulators industry will grow on account of the large-scale adoption of these insulators across commercial and industrial areas. Favorable power distribution reforms along with increasing commercialization and industrialization will further enhance the product demand. Cables and transmission lines will witness significant growth on account of increasing development of HVDC lines. Growing legislative support for the expansion of cross border transmission systems will further propel the industry landscape. Ability of these insulators to withstand the conductor load and minimize the leakage current will enhance their deployment. Transformers held over 19% of the global market share in 2017. Rising electric infrastructure spending along with continuous industrial expansions across emerging economies will foster the industry growth. Investments by government authorities to reduce transmission losses will further propel the industry landscape. Suspension composite insulators market will grow on account of their widespread application across high voltage areas. These consist of metal discs in form of a string with number of discs varying as per the voltage grade. Ability to offer economical operation when compared to its counterparts will further boost the product landscape. Pin insulators are anticipated to expand over 7% by 2024. These insulators find applicability in overhead lines for voltages up to 33 kV and are prevalent across distribution and sub-transmission lines. Operational flexibility, high anti-fog performance and ease of manufacturing are some of the key parameters stimulating the product adoption. Utilities composite insulators will grow on account of increasing R&D expenditures for the modernization of grid networks. Growing emphasis on the establishment of wide-ranging transmission links coupled with adoption of electrification programs will further propel the product demand. Commercial & industrial composite insulators is expected to grow over 8% by 2024. Growing emphasis on the establishment of wide-ranging frequency distribution links coupled with the establishment of energy-efficiency protocols by the authorities will stimulate the industry landscape. 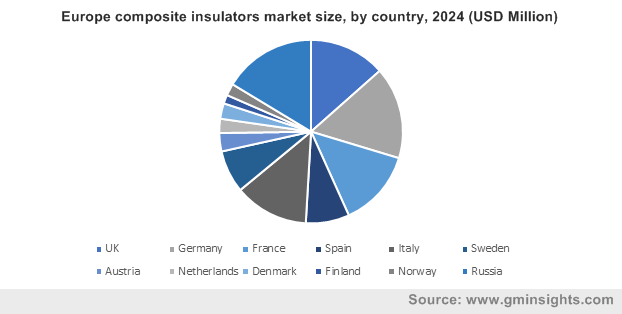 Increasing demand for reliable and lightweight composite insulators for integrating a sustainable production mechanism will boost the 11 kV composite insulators market. Ongoing expansion of residential areas along with rapid urbanization will positively fuel the product adoption. Furthermore, the operational suitability of these insulators to operate in diverse environments will drive the industry landscape. 33 kV composite insulators market will grow on account of their diverse application across the power & infrastructure sectors. Continuous deployment of electrical networks in residential establishments along with the extension of micro grid networks will positively stimulate the business outlook. Transmission composite insulators will grow on account of increasing investments by governments to ensure effective grid infrastructure. Subsequent upgradation of power transmission networks for optimized consumption of energy along with grid upgrading projects undertaken by governments of emerging economies will further fuel the industry landscape. The U.S. market is anticipated to expand over 6% by 2024. Increasing demand for retrofitting and revamping of the existing grid networks will propel the business landscape. Ongoing infrastructural investments coupled with stringent framework on grid modernization will positively impact the industry growth. China market, in 2017 was valued over USD 300 million. Government efforts toward renewable power integration and clean energy economy will fuel the industry growth. Support mechanisms and endowments provided by state-owned utilities for the expansion of T&D infrastructure will further propel the business landscape. The State Grid Corporation of China in 2016 announced to expand the electrical transmission infrastructure of the country by increasing its investment by 28% over the period of next five years. Eminent industry players operating in the industry include General Electric, ABB, Olectra Greentech, Lapp Insulators, Deccan Enterprises, Seves Group and TE Connectivity among others. Composite insulator is an insulating material that prevents the undesired flow of current from an electric system and provides a resistive path to the current flow. These are used as a means of insulation to ensure optimum electrical and mechanical strength.